The Portofino has plenty of fine dining options. I loved the singers that went from table to table in this restaurant. They came to our table twice, and their voices were smooth as silk. I would have been happy to have them with our party for the evening. 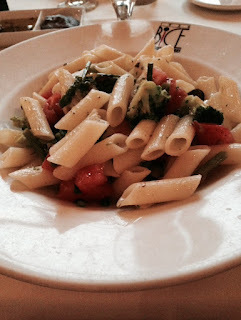 We asked for gluten free pasta dishes that were not on the menu, with dairy free options. The results were not as good as the gluten free dairy free pasta at Bice or at Yacht Club. It was good, but not fantastic. The ingredients lacked a blending or finesse, but the restaurant is willing and able to create gluten free and dairy free options, so it is good to give it a try. We did not receive gluten free bread here, but we didn't ask for it. There is a chance it is available. All in all, we had a very nice meal experience with pleasant service and enjoyable entertainment. We found plenty of gluten free and dairy free breakfast options and easy seating at Trattoria Del Porto. While the normal breakfast option is a buffet, they do have a menu that can be ordered from. For cross contamination concerns, you can order the buffet with an allergy, and have your food prepared safely in the back. Our server brought out omelette and hash browns with gluten free toast for my daughter. She can eat dairy, so she had cheese and a mango smoothie, which she very much enjoyed. One morning, I had smoked salmon, gluten free toast, fresh squeezed orange juice with tomatoes and eggs. This was very refreshing. Another morning, we had gluten free "buttermilk" pancakes. They were able to make the pancakes gluten free and dairy free (I had mine without whipped cream). These pancakes were very fluffy and very yummy. The serving was enormous. We were not able to eat them all, but it was still a treat that we enjoyed. They also had gluten free muffins on their buffet, but I did not try them. The orange juice is fresh squeezed and so nice. We had a nice family meal at the Bice restaurant on the 2nd floor of the Portofino hotel at Universal Orlando. We had no trouble ordering gluten free, here. The servers were incredibly attentive and they brought out gluten free bread and safe dipping options. 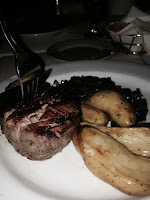 My daughter had potatoes, chard, and steak. She loved the steak, though she was not a huge fan of the vegetables. I had requested an item that was not on the menu. I asked if they could make me a pasta with gluten free pasta and dairy free sauce. I asked for something with greens, tomatoes, olives, olive oil and garlic, and they brought me a delicious pasta dish that rivaled the yummy dishes I received from the Yacht Club Disney resort in previous visits. This was filling, so I didn't have room for dessert. 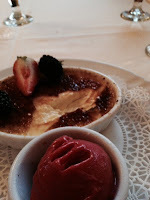 My daughter did opt to eat the gluten free, but not dairy free, creme brulee and raspberry sorbet. She loved the creme brulee, of course. The sorbet was a pale competitor to the crunchy and creamy dessert she enjoyed. This was one of my favorite meals of the trip. The piano played and our family had a very enjoyable visit while dining. We had another extravagant meal at The Palm inside the Hardrock Universal hotel. Really, the thing to order at The Palm is the steak. Their steaks are always tender and delicious. My daughter ate the steak and a gluten free french onion soup. She says it is her favorite soup, so that was a treat. I ordered the salmon with mango salsa and asparagus without the butter sauce. This was good, but not the star of the show. I highly advise ordering the steak if you are enjoying a dinner at The Palm. The service is always wonderful here, and the atmosphere is a lot of fun for family gatherings. As a nice cool treat on a 100 degree day at the pool, we stopped into Emack and Bolio's for a cold treat. My daughter ate a gluten free (not dairy free) ice cream. The last time we were here, they had a flavor labeled gluten free, but they didn't this time. Instead, we asked to see the container. We verified that there was not gluten in the ingredients. There is no guarantee of cross contamination safety here, so you take your chances with that. My treat was an ice cream float, but without dairy or gluten. I asked for the dairy free raspberry sorbet in gingerale and it was remarkably refreshing and fresh. I've been craving this raspberry sorbet ever since. We enjoyed another delicious breakfast at The Kitchen. I only wanted simple eggs and bacon with their fresh squeezed orange juice, and the chef made this up in the back for me, free of dairy, free of gluten, free of cross contamination. The chef also made an omelette for my daughter. We both ordered gluten free pancakes. For my daughter, one was with chocolate chips. These pancakes were really delicious. I am not normally a fan of pancakes, but I loved how these turned out, and they kick started a pancake craving that followed me back home. The chef did offer to make us anything we wanted from the buffet, but he strongly encouraged us to wait for items to be made rather than eat off the buffet due to cross contamination concerns. The chef even came out and checked on us afterward, and we let him know that the pancakes were a delight. It was another great breakfast at The Kitchen. For me, the salad is the perfect entree at The Palm inside the Hardrock Hotel. I have ordered it twice, as I am not a big fan of steak, and this is a very filling and delightful salad option that is gluten free and dairy free. The dressing is nice, and not overpowering. I enjoyed it. My daughter had the steak with potatoes and steamed veggies. She said everything was good. We were far too full to consider dessert options. Another fantastic breakfast at the Kitchen. The chef felt that making our food would be much safer than using the buffet, so we let him know what we wanted, and they made us specialty breakfast of omelettes and eggs, potatoes, salsa, bacon. It was gluten free dairy free, and delicious! And the servers here are always very helpful and attentive. We had a great time. We are back from another great Florida trip, and I have more reviews for you! First up is the Loews Portofino Bay Hotel, which is one of the main 3 Universal on Site hotel options. We had an unplanned dinner at the Trattoria Del Porto. Without knowing anything about the restaurant, we wandered in and we were happy to see that they had a gluten free menu! Wonderful. While the restaurant did offer a gluten free pasta, my daughter opted for a gluten free burger and fruit, while I had a salad. Sorry, no food photos. The food here was good, and the kids had fun with the entertainment provided (a young lady doing face paints and making balloon animals). There are many upsides to dining here. The atmosphere of the hotel courtyard is beyond charming. The downside was that the staff we encountered was not trained well in dealing with allergies or even substitutions in general. Three of our orders came out wrong, with foods either containing gluten, or just the wrong food (not what we ordered). We sent them back and waiting for the correct food. They did make good on getting us fed, but it took a long time, and they did not offer any monetary compensation or future credits to make up for their multiple mistakes. I would not hesitate to try eating here if you are in this area, but ask for a manager or chef, at least. Hopefully you won't run into any problems. The last bites pictured above, the poolside servers did offer a gluten free bun, but my daughter declined. They had fruit as the side for her burger. They did forget to bring out the lettuce, tomatoes, and pickles that she asked for, but they got them promptly when we asked again. This was quick and easy when you are at the pool and ready for a bite. I ordered for the kids while they swam and when they were ready, the food arrived just in time. They had salads and nachos on the menu that looked like they would be very good without gluten or dairy, as well. We enjoyed breakfast buffet here, and while there was concern of cross contamination, the staff went back to the chef and had any foods we wanted prepared safely. We had potatoes, omelets, breakfast meats and fruits and everything was very good. We had no trouble walking in without a wait, and the kids enjoyed the rock music memorabilia and tunes. I recommend this as a nice leisurely (and filling) breakfast stop if you are staying at Universal. Just make sure you talk to your server and or chef. We stopped here in hopes of finding some dairy free and gluten free options, and we weren't disappointed. The dairy free choice was a raspberry sorbet. Again, the staff didn't seem to understand allergies and at first I was told there were no dairy free options. When pressed to see ingredients, I showed the staff member that the sorbet was, in fact, dairy free. They also offer a gluten free ice cream (not dairy free) that had gluten free brownies and gluten free cookie dough mixed in! Yum. We stuck with sorbet, though. My overall review of the Universal Hotel and Citywalk options is that the food options are there, but the staff lacks the training we are used to at Disney World. So, don't be afraid to eat, but do go in armed with plans to take longer and to be very clear about your allergies! These strike me as good places to bring the allergy cards that explain what you can't eat. The Palm is a high end restaurant for special occasions in the Hard Rock Hotel. We dined there in a group. We ordered many vegetables to share, and we were told that all the potato options we ordered were gluten free, as well as the green vegetables we ordered. My daughters split a filet, and asked for it medium. It was slightly overcooked (as were most of the steaks at the table), but otherwise, they did a very good job with our allergy restrictions. I noticed a flourless chocolate cake, but I did not inquire as we were all quite full. I opted for a salad with shrimp, avocado, and a citrus dressing. It was very good and I would choose that as my entree if I were to return to the Palm. We finally made it! It was fun, food was good, and they had a designated gluten free frier, so Bean was happy. Udi's buns were a nice choice. The nachos were gluten free (not dairy free in background) and really we had a fun time. I had a dairy free jerk chicken with rice and veggies. I liked it quite a bit, and you can see what the kiddo ordered. This was a rare dining experience for us in Universal area...no mistakes! LOL I recommend it.